The Qur'an is not a book that consists solely of lawful and unlawful deeds; it covers a wide range of subjects, including descriptions pertaining to moral perfection, various characteristics of human beings, all situations and circumstances that are likely to occur in this life, information related to the life of this world and the hereafter, fear of God, love for Him, the ways to attain the good pleasure of God, etc. In brief, the Qur'an is a book that consists of all the information that man may need throughout his life. It is the Book the Creator has sent to the created and it will remain as the sole guide for humanity until the Day of Judgement. Those who are ignorant of the Qur'an and have prejudices regarding it assume that it only refers to the past and thus is irrelevant to our time. Contrary to the assumptions of these people, however, the Qur'an is not a book that only describes events that happened 1,400 years ago. It is a guide to humanity that informs man about events that happen in all ages, and about the Day of Judgment that puts an end to the life of this world. A believer who becomes aware of the importance and indispensability of the Qur'an to his life must have a good knowledge of the Qur'an so that he can conduct his entire life in line with the principles of the Qur'an and thus serve God as is due. This book is prepared to strengthen the knowledge of the Qur'an for those who wish to get to know Allah, who are willing to meticulously perform their duties as servants of Allah, reorient their lives in line with the values of the Qur'an and make attaining the good pleasure, mercy and Paradise of Allah their main objective. 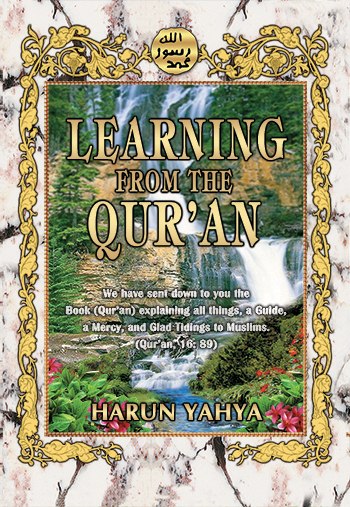 You can read Harun Yahya's book Learning from the Quran online, share it on social networks such as Facebook and Twitter, download it to your computer, use it in your homework and theses, and publish, copy or reproduce it on your own web sites or blogs without paying any copyright fee, so long as you acknowledge this site as the reference.